The Battle of Nashville was a two-day battle in the Franklin-Nashville Campaign that represented the end of large-scale fighting west of the coastal states in the American Civil War. 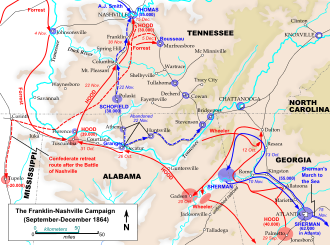 It was fought at Nashville, Tennessee, on December 10–19, 1864, between the Confederate Army of Tennessee under Lieutenant General John Bell Hood and Federal forces under Major General George H. Thomas. In one of the largest victories achieved by the Union Army during the war, Thomas attacked and routed Hood's army, largely destroying it as an effective fighting force. Furious at his failure at Spring Hill, Hood pursued Schofield to the north and encountered the Federals at Franklin behind strong fortifications. In the Battle of Franklin on November 30, Hood ordered almost 31,000 of his men to assault the Federal works before Schofield could withdraw across the Harpeth River and escape to Nashville. The Union soldiers repulsed multiple assaults and inflicted over 6,000 casualties on the Confederates, which included a large number of key Confederate generals, doing heavy damage to the leadership of the Army of Tennessee. Schofield withdrew from Franklin during the night and marched into the defensive works of Nashville on December 1, there coming under the command of Thomas, who now had a combined force of approximately 55,000 men. By and large, his troops were veterans, the IV Corps under Brig. Gen. Thomas J. Wood and Schofield's XXIII Corps having fought in the Atlanta campaign and Maj. Gen. Andrew J. Smith's "Detachment of the Army of the Tennessee" (a part of the recently discontinued XVI Corps had been redesignated with this unusual name on December 6) having fought at Vicksburg, in the Red River Campaign, at the Tupelo against S.D. Lee and Nathan Bedford Forrest, and in Missouri against Sterling Price. While Wilson's cavalry had combat experience, most of it had been of the wrong kind at the hands of Nathan Bedford Forrest, John Hunt Morgan, or Joe Wheeler. Only Maj. Gen. James B. Steedman's Division lacked experience. It was composed of garrison troops and railroad guards from Tennessee and Georgia and included eight regiments of United States Colored Troops. Union forces had been constructing defensive works around Nashville since the time the city was occupied in February 1862. By 1864, a 7-mile-long semicircular Union defensive line on the south and west sides of the city protected Nashville from attacks from those directions. The line was studded with forts, the largest being Fort Negley. The trench line was extended to the west after December 1. The Cumberland River formed a natural defensive barrier on the north and east sides of the city. Smith's troops had arrived by river on November 30, and their transports had been escorted by a powerful fleet of tinclad and ironclad gunboats. Thus, the river barrier was well-defended. Hood's Army of Tennessee arrived south of the city on December 2 and took up positions facing the Union forces within the city. As he was not nearly strong enough to assault the Federal fortifications, Hood opted for the defensive. Rather than repeating his fruitless frontal attack at Franklin, he entrenched and waited, hoping that Thomas would attack him. Then, after Thomas had smashed his army against the Confederate entrenchments, Hood could counterattack and take Nashville. The Confederate line of about four miles of fortifications faced the southerly facing portion of the Union line (the part occupied by Steedman and Schofield). From right to left were the corps of Maj. Gen. Benjamin F. Cheatham, Lt. Gen. Stephen D. Lee, and Lt. Gen. Alexander P. Stewart. Cavalry commanded by Brig. Gen. James R. Chalmers was off to the southwest of the city. The Confederate left flank was secured by five small detached redoubts, each having two to four guns with garrisons of about 150 men each. Hood made a serious strategic error before the battle. On December 2, he sent the three brigades of William B. Bate's Division of Cheatham's Corps to attack the Nashville & Chattanooga Railroad between Nashville and Murfreesboro as well as the Federal garrison in the latter city. Three days later, he sent an additional two brigades of infantry and two divisions of cavalry, all under Forrest's command, to reinforce Bate. Hood believed this diversion would draw Thomas out of the Nashville fortifications, allowing Hood to either defeat Thomas in detail or to seize Nashville by a coup de main once its garrison was depleted. While the railroad between Nashville and Murfreesboro was broken in a number of places, the Murfreesboro garrison drove off the Confederates in the Third Battle of Murfreesboro (also called the Battle of the Cedars) on December 7. Furthermore, Thomas was not fooled by this diversion, and remained in his fortifications until he was ready to attack on his own terms. Bate's Division and one of the two attached infantry brigades returned to Nashville, but Hood had seriously diminished his already outnumbered forces, and he had also deprived his army of its strongest and most mobile unit, Forrest and his cavalry. Cavalry Corps, (detached at Murfreesboro and not engaged at Nashville) commanded by Maj. Gen.Nathan B. Forrest with 3 divisions. Although Thomas's forces were much stronger, he could not ignore Hood's army. Despite the severe beating it had suffered at Franklin, Hood's Army of Tennessee presented a threat by its mere presence and ability to maneuver. Thomas knew he had to attack, but he prepared cautiously. His cavalry corps, commanded by the energetic young Brig. Gen. James H. Wilson, was poorly armed and mounted, and he did not want to proceed to a decisive battle without effective protection of his flanks. This was particularly important, since Wilson would be facing the horsemen of the formidable Forrest. Refitting the Union cavalry took time. On December 7, 1864 the USS Neosho engaged the Confederate batteries at Bell's Bend. This sketch shows the ironclad moving upstream, firing on the batteries on the north bank. Battle of Nashville, December 15–16, 1864. Thomas planned a huge wheeling movement that would ultimately come down on the Confederates' exposed left flank. Wilson's Cavalry Corps moved west on Charlotte Pike once an early morning fog dissipated, driving off the Confederate cavalry patrolling the area between the Confederate left and the Cumberland River. Smith's XVI Corps detachment followed, turning south after a mile or so towards the Confederate flank. The cavalrymen formed on Smith's right flank. Schofield's XXIII followed in reserve, and as the assault moved south a gap opened between Smith and Wilson which Schofield was directed to fill. At about 2:30 pm the Federals attacked the five redoubts guarding the Confederate left. Four brigades, two of cavalry and two of infantry, overran Redoubt No. 4 and then Redoubt No. 5, notwithstanding the spirited resistance of the defenders of Redoubt No. 4. Another of Smith's brigades captured Redoubt No. 3; however, its commander, Col. Sylvester G. Hill, was killed by Confederate artillery firing from Redoubt No. 2. He was the highest ranking Federal officer killed in the battle. Smith's troops proceeded to Redoubt No. 2, which was quickly captured. Col. Sylvester Hill was killed by Confederate artillery fire from Redoubt No. 2, just as his men overran Confederate Redoubt No. 3 on the Confederate left flank. In the meantime, the IV Corps had been tasked with making a frontal assault from Granny White and Hillsboro Pikes on the left end of the Confederate line. The assault was to begin once Smith's troops began their assault on the left flank redoubts. The Confederate line was supposed to lie on Montgomery Hill on the north side of Brown's Creek. While the Confederates had originally established their line there, they had withdrawn to equally strong positions on the south side of Brown's Creek, as the original positions were exposed to artillery fire from the Nashville forts. The IV Corps proceeded deliberately up Montgomery Hill, only to find that it was defended by a thin skirmish line. They stopped to reorganize, and at about the same time that Smith's Detachment was rolling up the Confederate redoubts, they advanced on the main Confederate line. Thus it happened that Redoubt No. 1, the last bastion on the Confederate left flank, was captured by troops coming from the north, south, and west. Stewart's corps had been wrecked by the day's fighting and retreated to a new line of defense a mile or two to the south. Rearguard actions by reinforcements from Lee's Corps kept the retreat from becoming a rout. With the collapse of the Confederate left, Cheatham's and Lee's Corps followed to the new line. Brig. Gen. John McArthur, one of Smith's division commanders, was aware of this. He also saw that the Confederate lines were being badly battered by Federal artillery, which was firing on them from nearly every direction. At about 3:30 p.m. he sent a message to Smith and Thomas that unless he were given orders to the contrary, in the next five minutes his division was going to attack Shy's Hill and the Confederate line immediately to its east. A Battle of Nashville monument was created in 1927 by Giuseppe Moretti, who was commissioned by the Ladies Battlefield Association. Erected in the years immediately following World War I, the monument honors the soldiers of both sides and celebrated a united nation. The monument was severely damaged by a tornado in 1974, and during the 1980s interstate highway construction left the monument landlocked on a small plot of ground overlooking the massive highway interchange of I-65 and I-440. In 1999 the monument was relocated to the Nashville Battlefield Park at the intersection of Granny White Pike and Clifton Lane, just north of the Confederate line on the first day of the battle. Nashville City Cemetery: Union dead from the battle (and some Confederate dead) were buried in an annex to this ante-bellum cemetery. ^ The XVI Corps was redesignated with this unusual name on December 6. ^ a b c d e Eicher, p. 780. ^ Kennedy, pp. 395–96; Esposito, text to map 152. ^ Welcher, pp. 611; Sword, p. 448; Jacobson, p. 452. ^ Welcher, p. 601; Eicher, p. 776; Niven, p. 121; McPherson, p. 195; Official Records, War of the Rebellion, Armies, vol. XLV, p. 764. ^ Official Records, War of the Rebellion, Armies, vol. XLV, p. 744. ^ Official Records, War of the Rebellion, Armies, vol. XLV, pp. 745, 755. ^ Official Records, War of the Rebellion, Armies, vol. XLV pp. 617–18, 746, 755. ^ Sword, pp. 293–95; McPherson, p. 195; Niven, pp. 125–26; Kennedy, p. 396; Official Records, War of the Rebellion, Armies, vol XLV, p.747. ^ Davis, George B.; Perry, Leslie J.; Kirkley, Joseph W., eds. (1894). The war of the rebellion:a compilation of the official records of the Union and Confederate armies. 1. XLV. Government Printing Office. pp. 90–96. ^ Davis, George B.; Perry, Leslie J.; Kirkley, Joseph W., eds. (1894). The war of the rebellion:a compilation of the official records of the Union and Confederate armies. 1. XLV. Government Printing Office. pp. 664–669. ^ McPherson, p. 195; Sword, p. 289; Niven, p. 123; Eicher, p. 776. ^ Kennedy, p. 397; Sword, p. 312; Welcher, p. 602; Eicher, p. 776; Esposito, map 153. ^ "150 Minnesota Civil War » BATTLE OF NASHVILLE". Archived from the original on November 12, 2014. ^ "New Civil War monument honors Minnesotans who fought at Nashville". This Week in the Civil War. ^ "Nashville City Cemetery Association, Inc". ^ "Confederate Redoubt No. 1". Wikimedia Commons has media related to Battle of Nashville. Wikimedia Commons has media related to National Register of Historic Places in Davidson County, Tennessee.